Coulee Progressives: Great news! 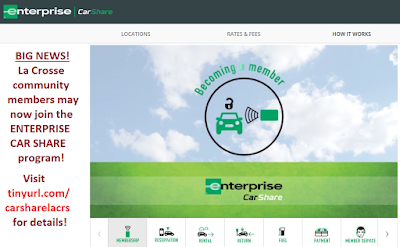 Car Sharing comes to LA CROSSE! 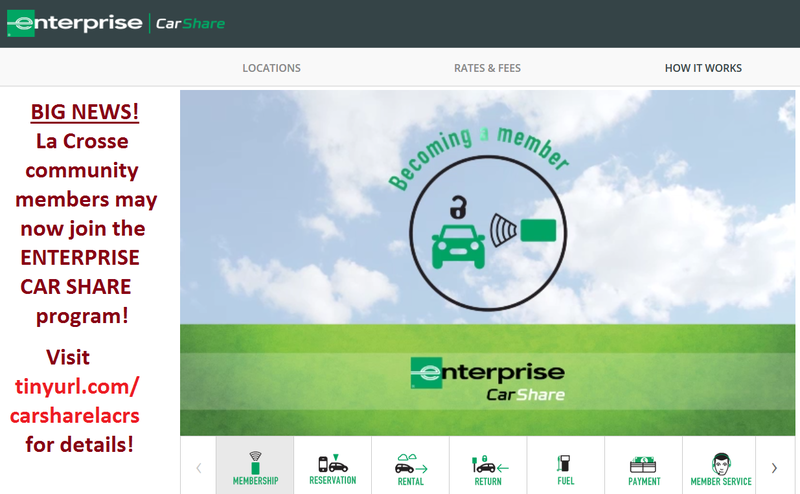 Thanks to Brian's work with Enterprise, they have expanded their UWL car share program to the wider La Crosse community starting RIGHT NOW!! Scroll down to view the Enterprise videos that explain how the program works. Basically, you are able to rent a vehicle for short periods of time by reserving them online. You get 200 free miles per day, and the fees you pay include registration, insurance, etc. AND GAS. So basically you can own a car without owning a car and pay for it just when you use it. We hope to set up a press conference about this new opportunity with Enterprise some time in September. If you join or plan to join this car share program, we hope you will consider participating when we get the event set up! Email couleeprogressive@hotmail.com if you'd like to be kept informed about this opportunity.